Jamaica’s natural beauty, colonial history and diverse cultural influences make it a Caribbean treasure. Though many tourists stick to insular resorts or briefly drop in by cruise ship, you’ll find a lot more to love if you go exploring. After a 9-day road trip around the island nation, here is my list of top things to do in Jamaica. 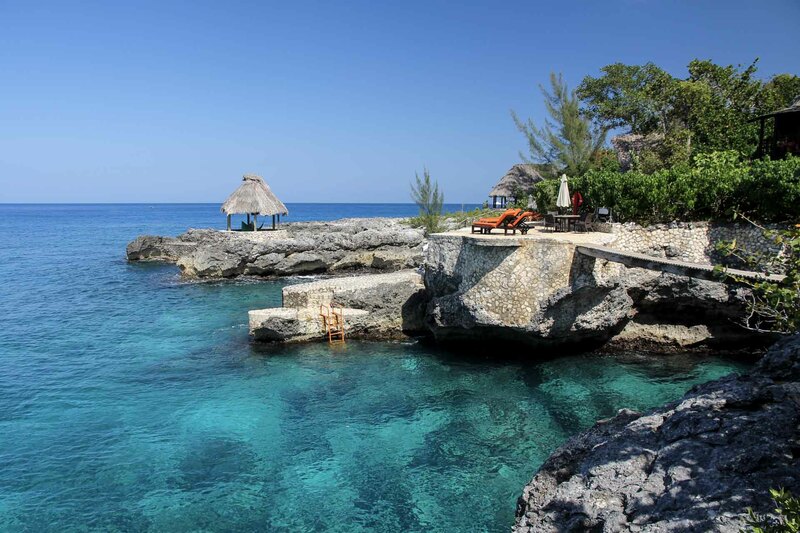 Negril’s coastal cliffs set it apart from other destinations in Jamaica. The bluffs are undercut by waves making the water depth largely safe for diving. Even if plunging off clifftops isn’t you’re idea of a good time (I plucked up the courage just once, but my husband was in daredevil heaven), the azure Caribbean waters are perfect for swimming or just floating along in an inflatable. Most of the west-facing cliffs have been commandeered by resorts, so aside from Rick’s Café, you will need to stay in a cliffside hotel to fully enjoy the rocky ledges. Treasure Beach is a quiet fishing village on the southwest coast that attracts a more intrepid set of travellers. The area offers great food, beautiful beaches and a lighthouse with the most incredible panorama of the Caribbean stretching to the horizon. There is limited boutique accommodation that books up fast, so make you plan well in advance if you’re travelling in peak season. I’m not a rum drinker, but I highly recommend a trip to Appleton Estate. The Estate is located in the lush Nassau Valley lined with sugarcane fields. Appleton tours are entertaining, interactive, informative and spiced up with intermittent rum cocktails along the way. There is a final, guided rum tasting and of course, a shopping opportunity. There is a restaurant in which we were the only diners the day we visited, and I wouldn’t recommend eating there unless, like us, you need to sober up a little before driving back to your accommodation! Note: If you drive yourself to Appleton Estate, make sure you take a detour via Bamboo Avenue. The Bob Marley Museum is located in the former Kingston home of Jamaica’s most famous musician. Enthusiastic docents take you through the property, but in our experience focused mainly on Marley’s discography and inspiring spontaneous sing-a-longs, rather than revealing much about the home, contents and recording studio. So for context, you may want to read up on his life before you visit, or just ask lots of questions. Fans and general audiophiles will not want to miss this opportunity to get an intimate look inside the home of Jamaica’s reggae legend. The 19th-century mansion turned museum of George Stiebel is located on a sprawling Kingston estate, not far from the Bob Marley Museum. Learn the history of this exceptional Georgian-Caribbean blend home and its gorgeous interiors on a guided tour and grab a scoop from Devon House I Scream as you explore the landscaped property. I didn’t know what to expect from Devon House, and was so impressed by the stunning mansion and its furnishings. Despite Jamaican Blue Mountain Coffee being renowned as one of the best javas in the world (and most expensive), you will be hard pressed finding a good coffee to drink throughout most of Jamaica. This is because coffee crops were introduced to Jamaica in 1728 by colonialists, and therefore most locals tend to be tea consumers. So if you really want a great coffee experience I recommend going straight to the source – the Blue Mountains. The cool, moist climate, nitrogen and phosphorus-rich soil, and excellent drainage of the mountain range are the ideal conditions for cultivating coffee. This ideal environment only falls between certain elevations, which are occupied by mostly small holdings and so Blue Mountain Coffee is produced in small volumes and has found its market mostly in Japan (80% of Jamaica’s prime beans are exported there) where they are prepared to pay its steep price. The Arabica coffee has a mild, sweet flavour and less caffeine than other beans. Craighton Estate Coffee Plantation offers educational tours including a tasting for the equivalent of USD25. Their informative tour will make a coffee connoisseur in less than an hour and you can pick up some beans to take home. I’m a sucker for a great waterfall, and Dunn’s River Falls is unlike any I have experienced before. Not only are the Falls beautiful, but they seemingly go on forever as they step 55m up the hillside from a white sand beach (which by the way, was the beach in THAT bikini scene from Dr No). The unique Falls are travertine rock formations that constantly change and regenerate from calcium carbonate sediments deposited by the cascading waters of Dunn’s River. It will take roughly 1-1.5 hours to climb the Falls, and you can accept or decline the help of a guide depending on your confidence level. Visit Dunn’s River Falls first thing in the morning, preferably on a day when there is no cruise ship in port at Ocho Rios (check schedule here), for the best photo-ops and a quieter experience. Wear water shoes. 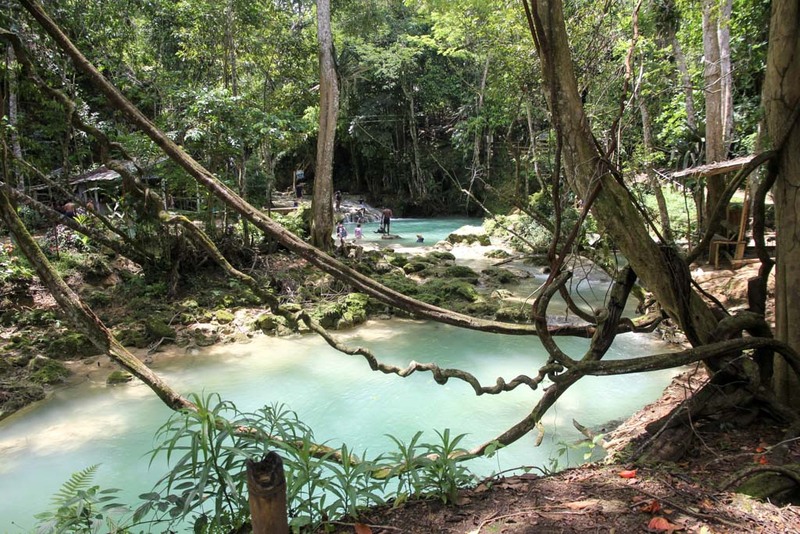 Irie Blue Hole (aka Blue Hole, Island Gully Falls or Secret Falls) are natural cascades and pools in the Jamaican jungle not far from Ocho Rios. Take a swim in the aquamarine waters of Blue Hole before a light trek up the river to Secret Falls. Adrenaline junkies like my husband will love the high diving opportunities. Entrance is USD15 at the gate and you will be allocated a guide to take you through (tips expected). Wear water shoes. 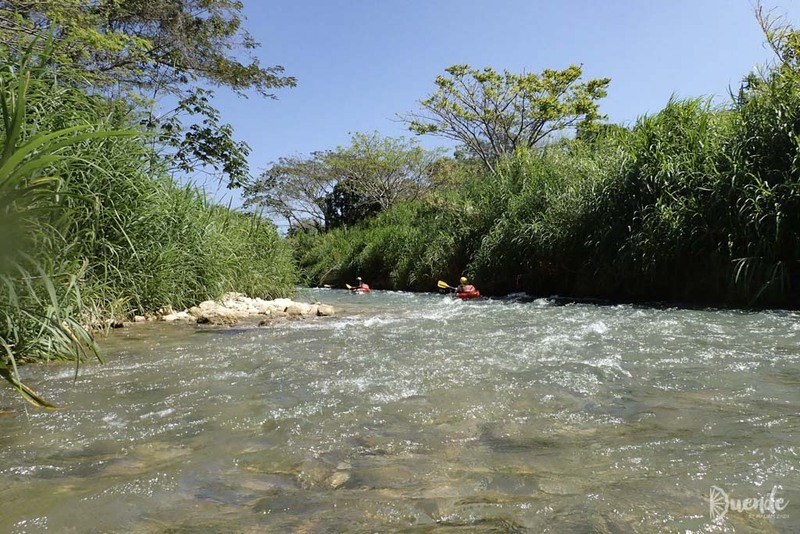 There are lots of opportunities to experience Jamaica’s most scenic rivers from the water, depending on how wet and adventurous you want to get. We chose to kayak a section of Rio Bueno, which was more like a controlled float. It was a relaxing trip down the River in which time we didn’t see any other tourists. As we neared the ocean, we were picked up by motorboat and taken to an exclusive beach nearby. Jamaica has many great houses in various states of preservation that are historically and architecturally fascinating places to discover. A great house is the colonial plantation home of wealthy estate owners from the height of the sugar industry and slave ownership. Greenwood Great House isn’t at the top of most tourist’s to-do lists, as it is generally overshadowed by the more highly publicized, Rose Hall. Of course, feel free to explore more than one great house, but if you only have time for one, make it Greenwood. The home’s original condition and furnishings make it more interesting than others on the island and they have a fabulous collection of vintage musical instruments. See more on Greenwood Great House here. Jamaica’s diverse history and melting pot culture results in a seriously flavoursome cuisine. Taste the African, Chinese, Indian, French, Spanish, Jewish and British influences through a range of signature dishes. From classic jerk chicken or pork and curried goat to the vegan cuisine of the Rastafarians called “ital”. Dig even deeper with a cooking class and take home your favourite recipes as souvenirs. 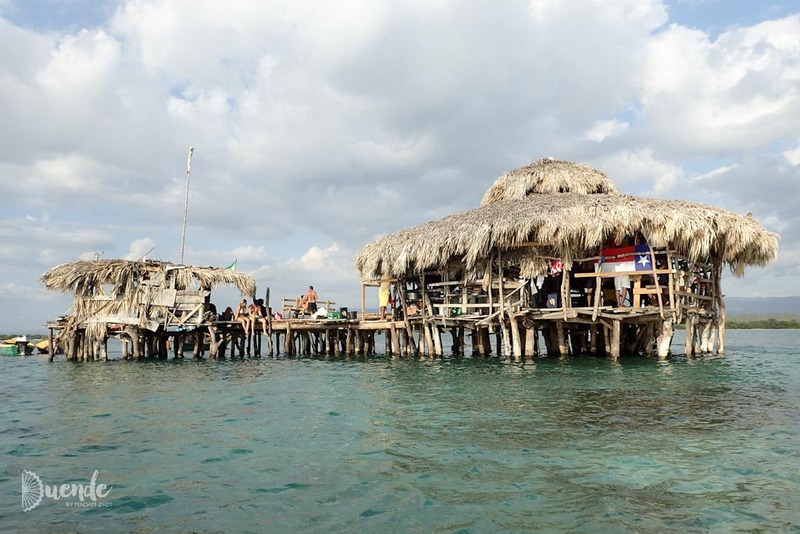 One of Treasure Beach’s most highly recommended and overrated attractions is Floyd’s Pelican Bar. The drinking spot housed in a stilted structure offshore is only accessible by boat and is really cool… in theory. However, the reality is a crowded platform overwater platform, overpriced drinks served in ocean-polluting plastic cups, and a constant stream of rubbish floating by in the shallow waters – dirty nappy anyone? It’s not worth the money you will pay to get out there and spend a few hours drinking. There are nicer oceanside spots to enjoy La Dolce Far Niente (the sweetness of doing nothing)! Jamaica provides a fantastic mix of natural and cultural attractions, all set on a tropical island for your convenience and pleasure. Don’t restrict yourself to a resort because there are so many fabulous things to do in Jamaica that it would be a shame to miss. For more on planning your Jamaica journey, see 5 Things to Know Before Planning a Jamaica Road Trip and packing list for independent explorers. Oh wow, I had no idea Jamaica was so diverse! I would definitely opt for a road trip over a resort or cruise. The falls and waterhole look particularly picturesque! Honestly Claire, it surpassed all my expectations. If you do road trip through Jamaica, there are some additional considerations such as road conditions and safety. I have a blog post on the topic called 5 Things to Know Before Planning a Jamaica Road Trip that will help with planning. Happy Travels! I am hoping to visit next year for my anniversary! Thanks for the great post!! Wishing you a wonderful anniversary and trip to Jamaica! Love it! One day I’m sure I will get to Jamaica, so these things will be on the list! You’re right Charlotte, the food is incredible. Even better if you can time your trip for lobster season!